Invacare - Polyester Mesh Sling with Commode Opening. Caregivers can weigh, transfer, reposition or help toilet the user. 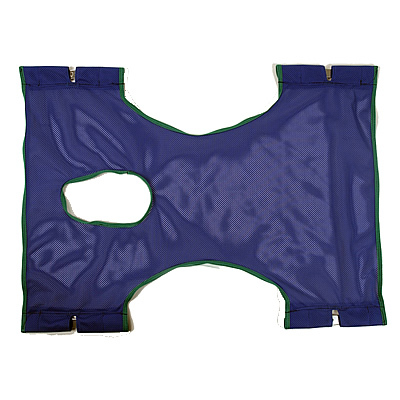 The Invacare Standard Mesh Sling features a commode opening for toileting activities. It features a fully padded fabric that forms a soft yet supportive surface. The soft-brushed lining helps prevent sliding for ultimate comfort and skin protection. And the new stretch-resistant feature means the slings will hold their shape, for superior support and ease of positioning. One-piece contour sling design supports users from shoulders to knees.